Randolph County Alabama is set amidst a landscape of hills and many lakes and river and offers many opportunities for wildlife viewing and outdoor recreation. 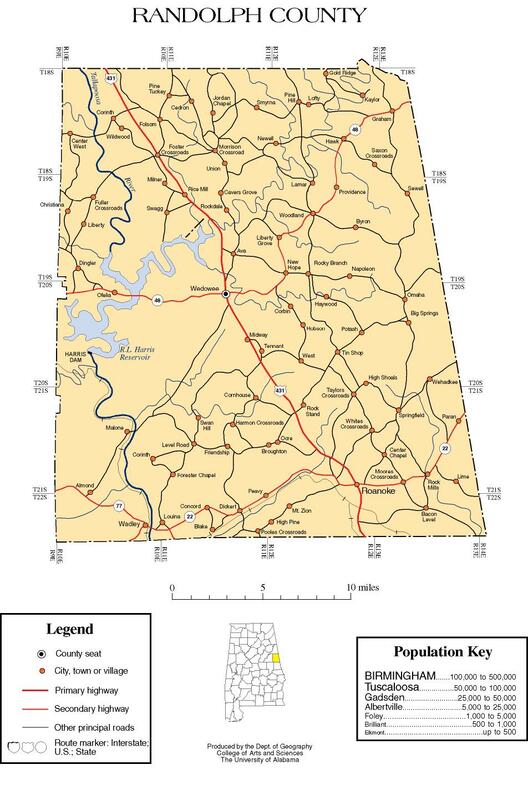 The Alabama Legislature created Randolph County on December 18, 1832, from lands acquired from the Creek Indians in the 1832 Treaty of Cusseta. The Tallapoosa River runs through Randolph County and is home to 120 species of fish and 31 species of mussel. The R. L. Harris Dam forms the 10,000-acre Lake Wedowee on the Upper Tallapoosa. Both the Upper and Middle Tallapoosa tributaries offer a range of recreational opportunities and scenic views in Randolph County. A few tributaries of the Chattahoochee River wind their way through the eastern half of the county as well. On the east bank of the Tallapoosa River, in Randolph County, Alabama, near the mouth of Cedar Creek. Atchinalgi was destroyed on November 13, 1813 by General James White and his troops from Tennessee. Wikipedia contributors, “James White (general),” Wikipedia, The Free Encyclopedia, https://en.wikipedia.org/w/index.php?title=James_White_(general)&oldid=827827679 (accessed March 20, 2018). Following the Fort Mims massacre of August 1813, Andrew Jackson and John Coffee led the Tennessee militia into northern Alabama in October of that year to engage a contingent of hostile “Red Stick” Creeks. The militiamen scored victories at the Battle of Tallushatchee (November 3) and at the Battle of Talladega (November 9).